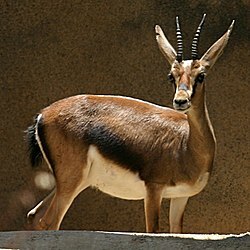 'S e seòrsa antalop no gobhar-fhiadhaich (iolra:goibhrean-fiadhaich) a tha ann an Gazella cuvieri (Beurla: Atlas Mountain gazelle, Cuvier's gazelle, Cuvier's mountain gazelle, Cuviers gazelle, Edmi, Mountain gazelle) (Fionnlannais: Atlasgaselli) (Fraingis: Gazelle de cuvier) (Spàinntis: Gacela de cuvier). Tha iad a' fuireach ann am Maroco, ann an Aildiria agus Tuinisia. ↑ 1.0 1.1 1.2 1.3 1.4 1.5 1.6 1.7 1.8 Retrieved [1, 11, 2015], from the Encyclopedia of Life,http://eol.org/. Air a tharraing à "https://gd.wikipedia.org/w/index.php?title=Gazella_cuvieri&oldid=491686"
Chaidh an duilleag seo a dheasachadh 18 dhen Fhaoilleach 2015 aig 09:04 turas mu dheireadh.